I was sitting at the library yesterday, reading Play With Me to one of my students, when all of a sudden, another came up to me. “Paul,” she said, and tapped me on the arm. I did my best to keep my gaze on the book, as I did not want to reinforce or give attention to her interrupting behavior. “Paul,” she said again, continuing to tap me. Within a few seconds, he bright eyes came into my periphery, her smile beaming across her face. “Oh, sure!” she said in her perky tone. In that moment, this child learned two things: (1) Interrupting isn’t a preferred behavior, and (2) Interrupting is not going to get a problem solved faster. But I didn’t do it by raising my voice, I didn’t do it by saying “don’t interrupt me,” and I didn’t do it by making her feel bad. Instead, I framed it through the lens of “expected behaviors.” Eventually, I got to her question, but not until I had finished the story with [Natalie] first. This is something I learned the past two years in Chicago with the help of the school psychologist and social worker when working with a student with significant behavioral needs. The terms “expected” and “unexpected” behaviors helped make his behavior choices concrete, while also giving me framework to apply to all settings. There are “expected” and “unexpected” behaviors in all contexts and situations; it’s just a matter of identifying those behaviors. 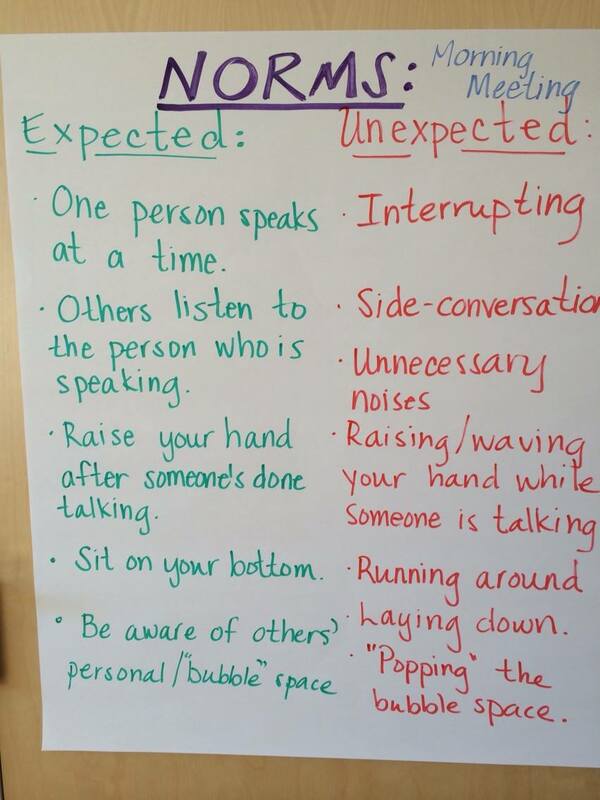 So yesterday morning, as the topic for our morning meeting, we made a list of “expected” and “unexpected” behaviors for the morning meeting. While we did this, we role-played, had some laughs, and discussed how some of the unexpected behaviors make us feel. At one point, as all of the kids were talking and reflecting, I let out a high-pitched scream, rattling the windows and probably their eardrums, too. All of the children erupted in giggles. “It made us giggle!” one of the kids said. Teaching kids how to behave is really difficult. The last thing teachers want to do is be authoritarian figures in the classroom, but authority is a part of our jobs. So how do we strike that balance between being a dictator and being a leader? Well, I don’t think I’ve fully figured that out yet, but I will say that being open with students and telling them how you feel about their unexpected behaviors is a great first step. Structure is liberating, not limiting… especially when it’s done well!